Our online courses are some of the most comprehensive online education programs for bartending on the planet. We have a massive amount of content on there- 10+ hours. Welcome to Reno Bartending School. 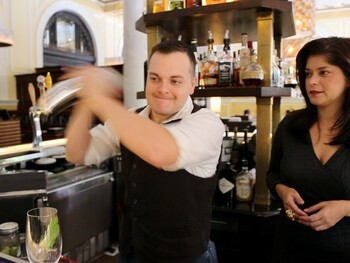 We are the leading provider of bartending education in Reno. We have taught more students how to bartend than anyone else in Northern Nevada. Our online education system teaches you everything from the basics of pouring, mixing, and responsible serving. It is a mixture of quizzes, readings, and videos. We also then offer you some online certifications. We can get you a school certification and TIPS certification without you even having to leave your computer. Our online courses start at just $99 and can be done at anytime. 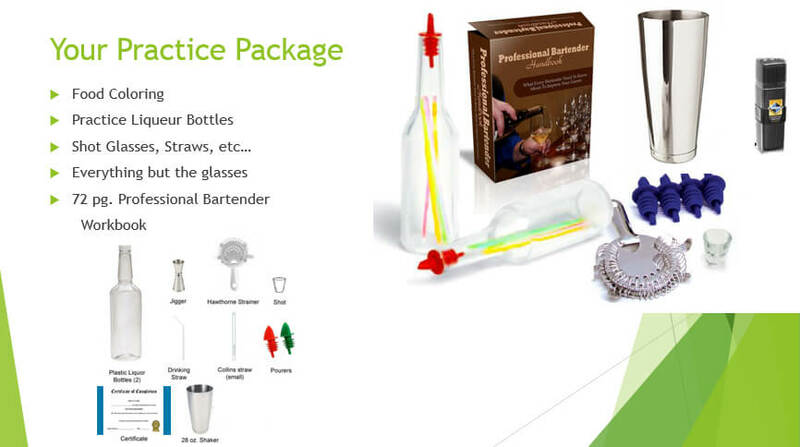 Our online courses can also include an in-home bartending kit which you’ll use to gain confidence and practice before heading to a bar. 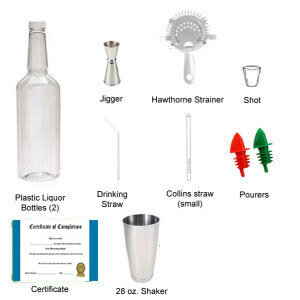 The kit includes everything you need from jiggers, strainers, straws, shot glasses, shakers, strainers, pourers, and more. On top of that, everyone also gets a comprehensive workbook. This has multiple choice questions and exercises that help you learn things like which glasses go with which drinks, and how to make some of the most popular drinks.